Call it primal if you like, I don’t claim to know all the evolutionary biology behind it, but men do seem to like their private little caves away from the rest of domestic life. If the man in your family is itching for some private grunt time, that’s no reason he can’t still benefit from the best of modern amenities. Here are some great ideas on how to make a man cave, ensuring that you have the man cave essentials. We hope it helps create the ultimate man cave for your needs. To be a true man cave, it can’t be part time. 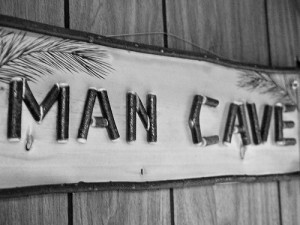 No man cave is a man cave unless it is only a man cave. It is the man’s space to be alone. Don’t mess with that. Ensuring this vital criterion will mean coming to agreement with spouse and children on the area of the home to be used and respecting the boundaries once it is used. I Love What You’ve Done With Your Cave. Decorating the man cave, or not, is the man’s business. That’s why they call it a man cave. Perhaps you have a theme in mind. Paraphernalia of a man’s favourite sport or team is a common choice. While the original man caves no doubt involved a lot of squatting and lying on beds of dried leaves and twits, your man cave is probably going to need some seating. A beat up old couch might be just the thing. Add one or two recliners, a coffee table and some shelving for your favorite magazines or music CDs and you’re in business. And don’t forget the appliances: a television, DVD player and a refrigerator are pretty standard requirements. A microwave oven can come in handy, too. As a general good rule of thumb in such enterprises, do make sure that your room has adequate ventilation to remove food odors. If the space you’re using lacks heating and cooling, a floor heater and window a/c unit may just do the trick. Food, drinks and utensils are the last bit of the puzzle. You have to keep your strength up, after all. This can get a bit dicey. Have you thought about food storage? And if you do store food in your cave, is it going to attract bugs and varmints? Is your storage area sufficiently sized so that you don’t have to go raiding the kitchen regularly? Maybe you could use a locked cabinet to keep dried and canned goods inside. Disposable plates and utensils are preferred over anything in need of washing. If you do decide to go that route, get a large trash can with a locking top and empty it whenever you’re done using it for the day. We hope that these great ideas on how to make a man cave, ensuring that you have the man cave essentials, helps you create the ultimate man cave for your needs.